1894: Iota Delta Alpha (originally known as the James Dolan Literary Association). This fraternity attracted men in the liberal arts interested in proceeding towards social and cultural advancement. 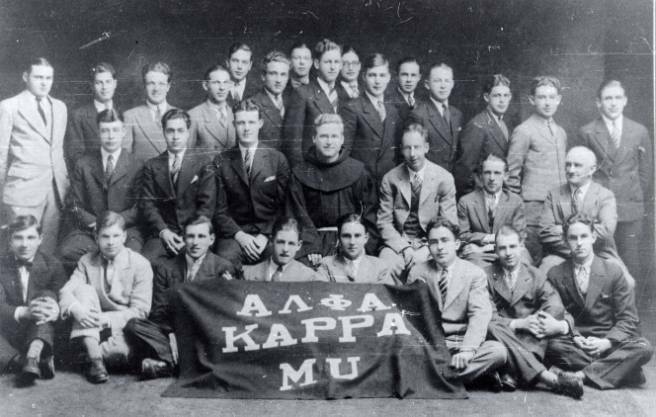 1915: Alpha Kappa Mu The fraternity was founded by Father Anthony Collins, Ph.D. The focus of the fraternity was on the medical world, and students enrolled in science courses were eligible for membership (it was mostly pre-med students). The group held weekly meetings. 1931: Tau Chi Sigma is formed for students interested in chemistry. This fraternity promoted early issues of Science Studies. They held banquets, lectures, movies, and had social nights. 1935: Beta Beta Chi was a fraternity formed for Business Administration students interested in commerce, finance, and accounting. This was one of St. Bonaventure's most active fraternities. 1945: Beta Delta Sigma Sorority was for female students with an interest in the sciences. This sorority investigated the natural sciences, and promoted a higher interest in science. Delta Sigma was a fraternity for non-boarding students interested in the advancement of the Bonaventure Men. Its main interest was in scholastic and social activities. Varsity "B" Club was a group for Bonaventure athletes to promote good fellowship.